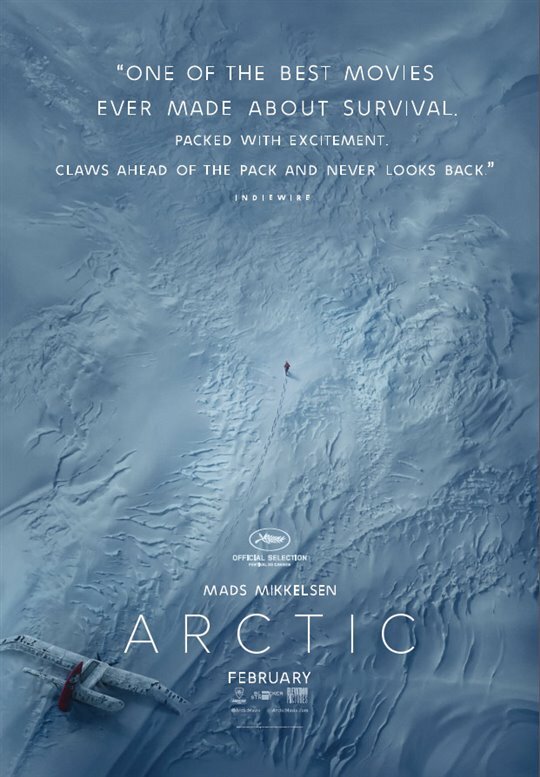 A survival movie in the most stripped down and literal sense of the term, Arctic centres around Overgård (Mads Mikkelsen), a man who is stranded alone in the middle of the Arctic following a plane crash. We are never explicitly told what transpired, and we don’t know exactly how long he has been stranded for, either. It could be a matter of weeks or even months. When we first meet him in the film, he has set up a sort of base camp for himself, with the crashed plane providing a source of shelter from the elements, as he relies upon fish pulled from holes in the ice in order to feed himself. Overgård gets a glimmer of hope when a helicopter circles above, but it soon crashes to the ground, and the sole survivor is a badly injured woman (Maria Thelma Smáradóttir) whom he pulls from the wreckage. He is no longer alone, but now has another person that he must take care of, who is reliant upon him to survive. With her health declining, he is faced with making the choice of whether to stay put in his makeshift shelter waiting for them to be rescued, or set out into the unknown in search of help. This is basically what transpires during the first act of Arctic, a film that unfolds with minimal dialogue and little in the way of traditional plot in order to offer a visceral look at survival in the face of the most extreme circumstances. Directed by Joe Penna, who co-wrote the sparse script with Ryan Morrison, this is a survival thriller distilled to its most basic form, pitting two people against the elements in a fight to stay alive. Penna follows his characters with an often observational style that at times recalls a nature documentary, as cinematographer Tómas Örn Tómasson fills the screen with sweeping images of the harsh snowy landscapes that put the vastness of their surroundings into perspective. The film is built around a compelling, mostly wordless performance from Mikkelsen, who embraces the physically demanding elements of the role and keeps us gripped to his portrayal of a man struggling to survive, even if we know almost nothing about his character. The film moves slowly, but it maintains a steady amount of interest thanks to the beautiful cinematography and excellent leading performance, rewarding patient viewers with its incredibly suspenseful final few minutes, before cutting to black at just the right moment. Arctic is now playing in limited release at Cineplex Cinemas Varsity in Toronto, and will be expanding to more cities across Canada in the coming weeks. ← Contest: Win a Copy of Goosebumps 2 on Blu-ray!